As you settle into a #SeptemberWhole30 routine, you’ll most likely find yourself cycling through 8-10 favorite recipes each week. This is actually a smart Whole30 success strategy; you’re establishing new habits that will become part of your food freedom long after your 30 days are over. But, it’s equally important that you don’t become bored with your Whole30 food. And with all of the delicious, fresh produce, protein, herbs, and spices that are in line with the Whole30 program rules, you shouldn’t have to! 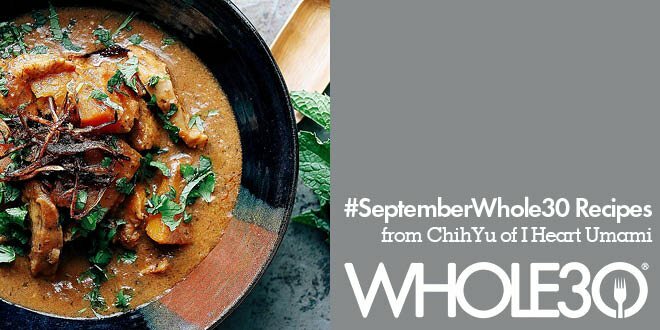 Three recipes from @iheartumami to inspire your #SeptemberWhole30, on the #Whole30 blog. Every Friday throughout the #SeptemberWhole30, we’ll publish a few inspiring and creative Whole30 recipes. If you find yourself with a little time this weekend to experiment with new recipes, try one of the dishes below. They’re from ChihYu Smith [Chee-Yu], the creator of I Heart Umami, a blog dedicated to teaching people to make Asian-inspired Paleo cuisine in under 30 minutes. Maybe one of them will become a new Whole30 favorite to add to your rotation! From ChihYu: This dish is savory, creamy, and deeply satisfying. Best of all, it’s quick to put together. I love making this recipe in large quantities and portioning it into individual servings before freezing. You can also pre-make a batch of homemade korma paste and freeze it in individual cubes using an ice cube tray. That way, when you are craving a warm and creamy meal after work, you can whip up this Korma for dinner in less than 20 minutes. USE a food processor finely mince garlic, shallots, ginger, and cilantro. ADD cumin, coriander, garam masala powder, sea salt, cayenne, tomato paste, and olive oil. Blend until it becomes a smooth paste. RESERVE 5 to 5 ½ Tbsp korma paste for 1 ½ lb chicken. Store extra korma paste in your freezer for future use. SLICE 1 large shallot into long thin strips. Heat 2 Tbsp coconut oil in a wok or frying pan over medium/medium-high heat. WHEN hot, add the sliced shallots, season with a small pinch of salt. Pan fry them and stir frequently for 8-10 mins or until golden brown. Be careful not to burn the shallots. Use a slotted spoon and scoop them onto a tray lined with paper towel. Spread them out so they crisp up. 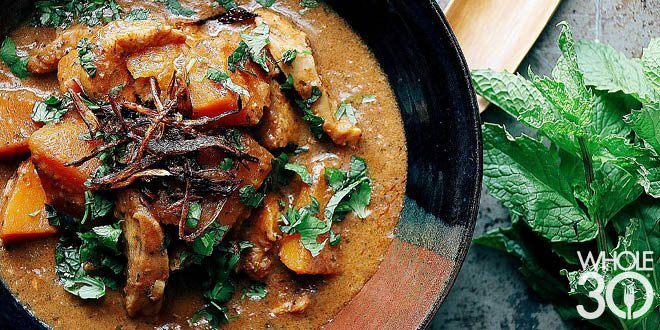 HEAT 2 Tbsp coconut oil in a large saucepan or deep frying pan over medium-high heat, when hot, add 1 large minced shallots and 5 to 5 ½ Tbsp homemade korma paste. Keep stir-frying the ingredients to prevent them from burning for about 2 minutes until fragrant. TURN the heat up to high and add sliced chicken. Stir-fry for 4-5 minutes until the chicken is lightly browned. ADD coconut milk. Give it a gentle stir. Cover the pan with a lid and bring to boil. ONCE it’s boiled, lower the heat to medium. Add diced pumpkin or butternut squash. Cover the pan with a lid. Let it simmer until the squash/pumpkin is cooked through. Stir the bottom of the pan periodically to prevent food from burning. TO SERVE: Sprinkle finely chopped mint/cilantro/basil leaves and topped with crispy shallots. 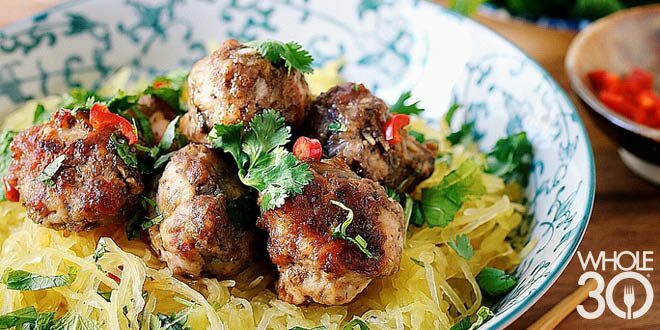 From ChihYu: These meatballs are perfect for a busy weeknight meal. You’ll have lots of hands-free time to play with the kids or catch up with friends while the meatballs and the golden delicious squash noodles are getting ready for you in the oven. Be sure to rotate the meatballs halfway through in the oven so that your meatballs will be an even golden brown color. These meatballs are also a perfect freezer meal—just let them cool down and pop them in containers or freezer bags for future use! *I use California fresno red chili pepper. Seeds removed. PREHEAT the oven to 400°F – 420°F. Slice the squash in half from stem to tail. Be careful not to cut yourself. Work slowly. Scoop out the seeds. Season with a little salt. Place the squash in a roasting pan. Cut -side down with a little water just enough to cover the bottom. BAKE the squash for 30-45 minutes. Smaller squash will cook more quickly than larger squash so check after 30 minutes. The squash is ready when tender and you can easily pierce the flesh all the way to the peel with a fork. Once it’s ready, scrape out the squash with a fork gently in the same direction as the strands. USE a food processor to chop 3 garlic cloves, 2 large diced shallots, and 5 oz. fresh shiitake mushrooms until fine. MIX them with ground meat with ½ tsp sea salt, fish sauce, coconut aminos, and olive oil. Combine well and form about 20 meatballs (about 2 ½ Tbsp filling/ meatball) on a large non-stick baking sheet pan. BAKE the meatballs for about 25 minutes total – 1st side: 15 minutes. Then, flip them and bake the flip side for an additional 8-10 minutes. Once the meatballs are cooked through. Remove from the oven and ready to serve. DRIZZLE 1-2 Tbsp dressing over squash noodles and meatballs. Sprinkle chopped herbs (mint, cilantro, basil) and watch them gone quickly than you think! From ChihYu: Imagine waking up in the morning and seeing a bowl of soft, gooey scrambled eggs waiting for you to devour. If you have a heavy pan, preferably nonstick or cast iron, and some farm fresh eggs and ghee (clarified butter) or coconut oil, you could be eating these soft gooey eggs tomorrow morning! 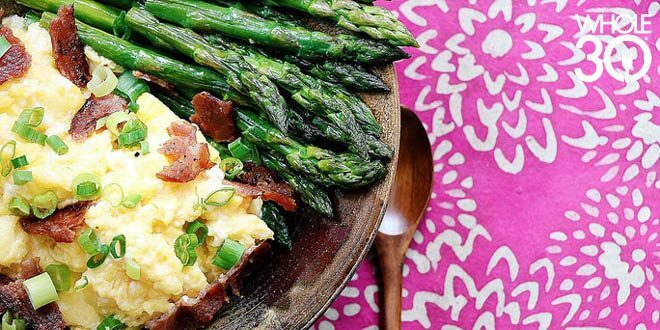 The trick to making soft, gooey scrambled eggs relies on one very simple technique—keep moving the pan off and back onto the heat throughout the cooking process to keep the pan temperature low, as this will prevent the eggs from being overcooked. BREAK 6 whole eggs into a room temperature non-stick pan or cast iron with 1 ½ Tbsp ghee (or melted coconut oil). USING a spatula, gently stir the eggs in a circular motion over medium to medium-low heat. KEEP gently stirring the eggs and as the mixture begins to set and curdle from the edge, move the pan off the heat for a few seconds then back on the heat to prevent the eggs from being overcooked. Keep stirring the eggs and moving the pan on and off the heat and repeat the process. ONCE the mixture is about 80 -85% curdled, remove the pan off the heat. SEASON with salt and black pepper. Garnish with chopped scallion or chives. ChihYu is the founder of IHeartUmami Cooking School For Asian-Inspired Paleo Food Lovers. She teaches busy working professionals and families prepare simple, quick, delicious meals in less than 30 minutes. She’s also a contributing writer for the Huffpost. Her work has been published throughout the U.S., Europe, and Australia. 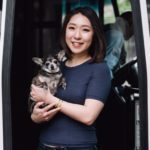 You can connect with her and find more of her delicious homemade meals on her Blog or on Instagram.